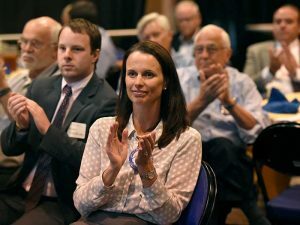 Rotary Club of Greensboro Meetings are held every Wednesday at the Greensboro Coliseum Terrace. The Rotary Club of Greensboro welcomes inquiries from potential members interested in becoming actively involved with us in fellowship and “Service above Self” in the community and internationally. We believe strongly that members get out of their membership what they put into it, so membership in our club requires the investment of both time (we encourage 100% attendance at meetings and participation in projects) and finances. Rotary Club of Greensboro Meetings start at 12:30 pm (on the dot!) and feature interesting and dynamic speakers. Come to Greensboro Rotary Club Meetings to see how we lend our time, talent and Leadership to our Greensboro and international communities. Our meetings are listed on our calendar and you can come to Rotary Club of Greensboro meetings as a guest of a member. Just complete the form on this page and we will make arrangements for your visit. Our meeting speakers are community leaders, entrepreneurs, servant leaders and always bring good questions – and answers – to our weekly meetings. Use the interest form on this page to come to Rotary Club of Greensboro meetings very soon and see for yourself! Would You Like to Attend Rotary Club of Greensboro Meetings?